A new phase II clinical trial currently enrolling patients with glioblastoma is now open at the Preston A. Wells Jr. Center for Brain Tumor Therapy at UF. 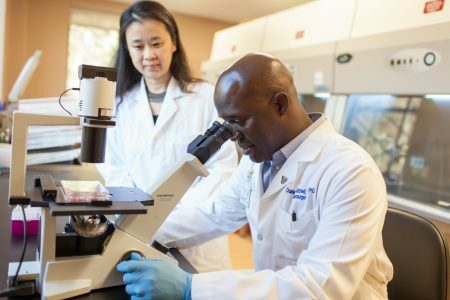 The study builds on prior UF research, including a small, randomized phase I trial led by Duane A. Mitchell, M.D., Ph.D., the Phyllis Kottler Friedman professor in the Lillian S. Wells department of neurosurgery, that resulted in several patients with the disease living longer than average — and, in a few cases, markedly delayed tumor progression. The results were published in Nature in 2015 and highlighted as a Top 10 Clinical Research Achievement in 2016 by the Clinical Research Forum in Washington, D.C. The new trial will assess the intervention used in the prior study with a larger population. Over the next five years, 120 newly diagnosed glioblastoma patients are to be enrolled at participating sites, including UF Health and Duke University Medical Center. Patients with glioblastoma, the most common and most lethal form of brain tumor, usually survive for just over a year. In the phase I trial, which was designed only to evaluate the safety of this process, Mitchell and collaborators at Duke University randomly assigned 12 patients to receive one of two different cancer vaccines. One of the vaccine formulations was associated with significantly prolonged survival, with three of the six patients living longer than three years. The purpose of the phase II trial is to extend the findings from the phase I trial and determine whether a new booster vaccine extends survival in patients with glioblastoma. Vaccine therapies have been increasingly used to treat different types of cancer; in this case, the vaccine is made of a patient’s dendritic cells, which are involved in turning on the body’s immune system. By loading dendritic cells with a protein produced by cytomegalovirus, a common virus present in glioblastoma tumors, and injecting them back to the patient, researchers aim to trigger the immune system to combat the virus — and thus the tumor cells. They also believe that priming the patient’s immune system with the common tetanus/diphtheria toxoid booster vaccine will increase the number of dendritic cells that make it to the lymph nodes, where the immune system is activated. In the new trial, two groups of study participants will receive the dendritic cell vaccine and the tetanus/diphtheria booster vaccine in addition to a standard chemotherapy treatment for glioblastoma, and a third group will receive standard chemotherapy and a placebo vaccine. Funding support for this study includes grant R01CA175517 from the National Cancer Institute; the trial is registered at clinicaltrials.gov (NCT02465268). How would you like us to respond to you?